Thomas Phillips, who's had season tickets for seven years, started running with the celebrity fan ball three years ago when his enthusiasm was captured by a cameraman and his image displayed on the stadium's jumbo screen. 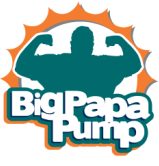 Videographers found him again the next game and dubbed him Big Papa Pump. A star fan was born. "Every home game, I hype the crowd. It's crazy and hilarious, but it's superb," said Phillips, who sports a Dolphins tattoo and dresses in hand-tailored Fins-wear. Soon, Phillips, of section 154, row 1, seat 22, was a recurring guest of the Sunshine Network's former Miami Dolphins Magazine show, interviewing football greats such as Jason Taylor, Ricky Williams, and Zach Thomas. An entire room in his home is decked floor to ceiling in Dolphins decor. "My whole experience with the Dolphins has been a blessing. I just want to be out there and do what I can for my team," Phillips said. 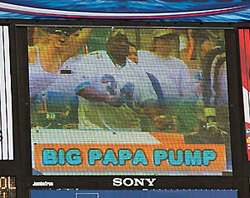 This is an excerpt from a 2005 Sun-Sentinel article about the Miami Dolphins titled, "Three super fans take to the tube".